It’s been hard to shake this one off our radar, but we are not complaining and hope you are as captivated as we are. 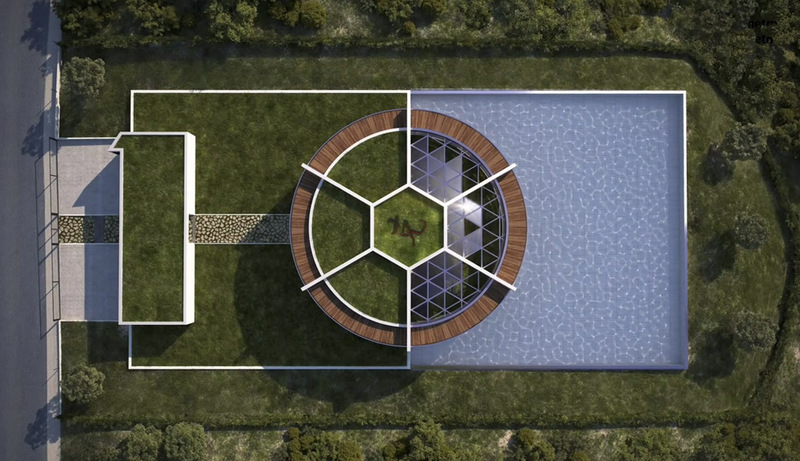 The rich and affluent never disappoint when it comes to their choice of real estate and Lionel Messi’s house is an odd and intriguing piece of architecture. It’s no doubt that he attracted his fair share of attention when it was in the making. He sure has caught ours and being that we aren’t selfish, we are going to take you along for the ride. If you’re ever flying over Barcelona and you see a house shaped like a soccer ball, it is definitely Lionel Messi’s house. The house itself is located is located 22 miles outside Barcelona in the Castelldefels area which overlooks the Catalan mountains. If the fact that he started to playing the sport at the tender age of 4 was not enough proof of his deep rooted love for soccer, then this is definitely confirmation. Apart from it’s original architecture and lush grounds, the house can boast of a cinema room, spa and an indoor football pitch. Being that Messi is a privacy freak, it’s no doubt that we have limited information on this topic. Nevertheless, we can say that, being on a salary of €40 million has it’s perks. It would be a shame if Messi lived in the luxurious mansion on his own and since Messi hardly plays the shame game, the other occupants of the house are his girlfriend, Antonella Roccuzzo, and two sons, Thiago and Mateo. Body art is increasingly becoming a popular way to express oneself, celebrities and non celebrities alike are keenly following this trend as old as time. Gone are the days of meaningless tattoos and tramp stamps, people getting in on this trend seldom get anything that does not hold some deep meaning or significance. Lionel Messi among tons of celebrities have often used tattoos to express themselves and the masses have followed suit. It’s about time we catch up on the football player’s tattoos and find out what makes them so special. Earlier on in the football player’s life, he was far away from his family. Messi was alone with his dad while he was still making his name with Barcelona, the rest of his family was back in Rosario along with his heart. Some believe that the tattoo of the athlete’s mother, located on his left shoulder blade was borne of distance between them. In addition to that, there were speculations that Messi’s decision was influenced by his team mate, Dani Alves, who is covered in tattoos. So in the year 2010, a nervous Lionel Messi walked into a tattoo parlor with his girlfriend, Antonella. He would not get inked till she did it first and confirmed that it was painless. Way to be the man, Lionel. With the arrival of his first son, Thiago, on November 2, 2012, Messi must have once again been overwhelmed with emotion. His second tattoo is a tribute to Thiago and is located on the back of his left foot. This gives it more significance because, it is his strongest foot with which he has been scoring legendary goals throughout the years. The tattoo consists of Thiago’s hand prints engraved along with his name below. The bond between the man and his son is obviously strong. No doubt whatever the athlete puts on his famous left leg is more than dear to him. Messi once again proved his undying love for football, by getting some related ink. This time, Messi got wings wrapped around a sword, a football on the left side and he didn’t leave out his lucky number 10, which is on the right. Most people have at least one tattoo referencing the supreme being they believe in, we have seen many crosses and extracts from Holy books. 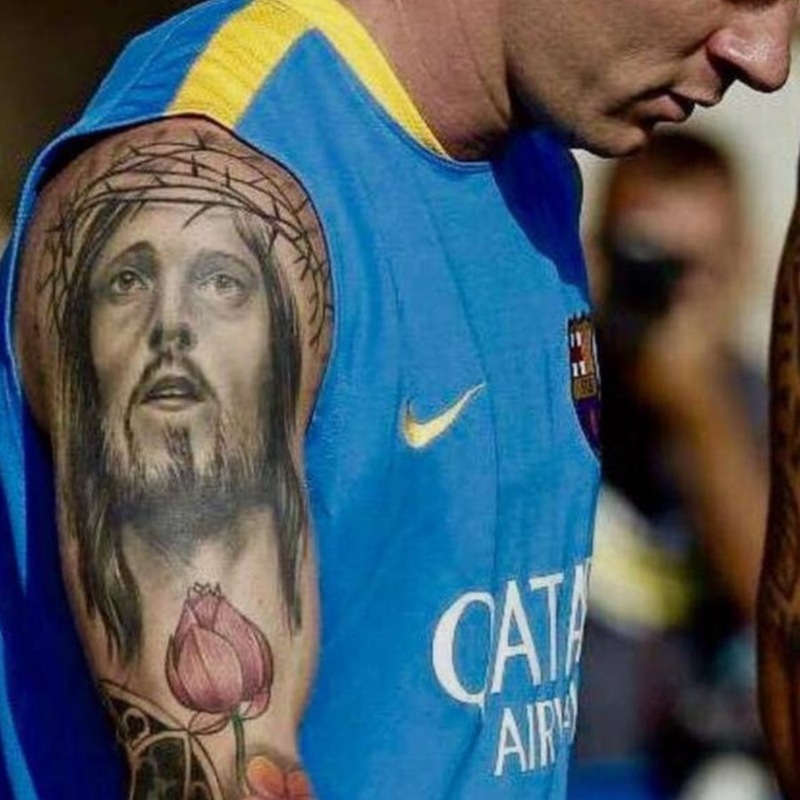 Messi on the other hand, went all out and got the face of Jesus Christ, of whom he is a believer, inked on his shoulder. While the, very intricate, tattoo was still in progress he diligently kept it out of sight, but since it was done he has flaunted shamelessly. Barcelona holds a deep significance for the athlete, it was the place that projected him to the world and now he projects it to us in form of an elbow tattoo. He got a tattoo of rose window which resembles the famous Barcelona church, Sagrada Familia. Once again we have to say, touche. He may not have a million of them, but this is by far the most meaningful collection we have explored so far.